Or how Bob Metcalfe set out to solve the challenge of wireless data and inadvertently gave Starbucks a business model. Is there a more ubiquitous, enabling technology than Ethernet? If there is it’s hard to think what it might be. It is the on-ramp that virtually everyone uses to access the Internet, without which the web would either have been accessed through terminals or would have been designed by someone in a big firm to be as complicated and expensive as possible. smartphones while consuming caffeine from coffee startups. Who would have thought of that surreal possibility in the 1970s. Most technologies are a pain to configure when they first hit the market; by the 1990s Ethernet worked beautifully and on the occasion it didn’t that was invariably a consequence of difficulty ‘binding’ a duff driver to a network card. Ethernet was always a friend because it was, fundamentally, on the side of the PC and its user. Officially, Ethernet started with Bob Metcalfe’s memo of 22 May 1973 where the super-engineer explained the idea and gave it a name but its real genesis started two years earlier with the University of Hawaii’s famous Alohanet. That was a brilliant but incomplete radio transmission system which Metcalfe set out to improve with two great insights. 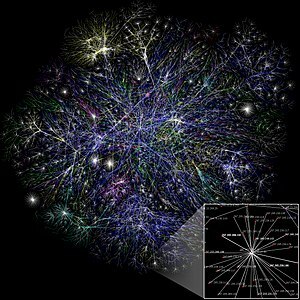 The first was that the wireless data 'collision' problem needed to be solved if Ethernet was ever to shift serious amounts of data. The second - partly a consequence of that hurdle - was that it should work irrespective of the medium, seeding today’s multi-purpose wire-n-waves transmission technology that crosses copper, fibre and of course the ‘ether’ (air) itself. It’s just a pity the world took so long to catch up. Commercially, Ethernet was shaped by its1980’s and 1990’s battle with the rival Token Ring system from IBM, which it eventually vanquished thanks to the latter’s proprietary complexity and cost. IBM thought Token Ring was the LAN equivalent of Betamax; most customers just thought it cost an arm and a leg. The copper-based Ethernet had energised the market. Later on the upstart took on the telecoms-based ATM, but that always looked like a one-sided battle. Despite the claims of maturity, ATM was a mad technology for anything below large networks because it required a whole layer of hardware-protocol translation to hook up to PCs. Ethernet won again thanks to its alliance with the PC but the commercial battle was far from straightforward and at times became bogged down in IEEE standardisation politics. In time, a legion of equipment firms helped establish Ethernet’s market dominance by inventing all sorts of switching hardware that made its case more grown-up. From its heartland in the PC and Local Area Network (LAN), Ethernet expanded to today’s Gigabit PC interfaces. It was pushed into WANs at higher 100 Gigabit Ethernet (100GbE) speeds that delighted even the highfalutin telecoms networks that once shunned it as a cheapskate’s way of connecting things. Ethernet will still be in some form here in the coming Terabit age and we should marvel at this. Something whose fundamental principles were sketched on a piece of paper 40 years ago by Bob Metcalfe will be used by people for whom 20th Century notions of what was possible will then sound like comedy gold.